Councilmember Dona Spring had a passion for many things and especially for the welfare of animals. During her sixteen years on city council she made numerous pleas for funding to replace the Berkeley animal shelter. 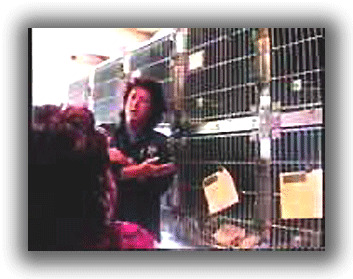 This presentation of Dona inspecting the animal shelter was first viewed at the Berkeley City Council May 1996 budget hearing. Script and production, L A Wood, Berkeley Citizen. Lost, stray or unwanted animals often wind up at the animal shelter. These animals are collected of city streets or sometimes brought in by the community. Hello, My name is Dona Spring and I want to share with you a recent visit I made to the Berkeley Animal Shelter in May of this year. Most residents are unaware that Berkeley supports an animal shelter. 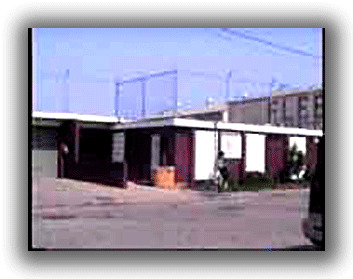 Located on Second Street, near University Avenue and the Aquatic Park, this west Berkeley facility has served the community since the 1920s. This afternoon I arrived at the shelter to meet with Jane, who has worked here for a number of years. Today she has offered to show me around and discuss some of the problems confronting the shelter and its operations. The first thing most visitors to the shelter notice is the antiquated office and lobby. Its single entrance and small lobby area are often filled with dogs, cats and their owners, which has made for some very interesting encounters. Fortunately, plans are in place to renovate this portion of the shelter. Although capital improvements are earmarked for this project, this amount will fall short of solving the more serious problems facing this facility that is sheltering Berkeley’s Animals. The first thing that Jane and I did was inspect the back portion of the shelter and inside the dog kennel. These rows of wire cages are a reminder of how many animals are detained each year. 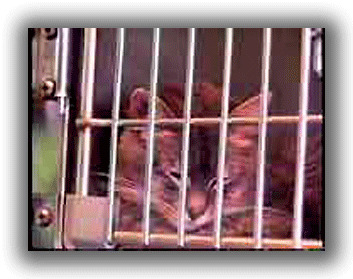 These cages have become torn and dilapidated over time. Damage has rendered a number of them unsafe and unusable. There is also a concern about the cracks which have appeared in many of the concrete slab cage floors. These cracks make it difficult to insure a sanitary surface. Although there has been some attempt to remedy this problem, even the fixes are falling apart. As Jane leads me around the shelter, I couldn't help but notice the poor accessibility and uneven floor surfaces throughout the shelter. Such problems show how outdated these buildings have become. I listened as Jane explained her concerns about the lack of ventilation. What surprises most visitors is the high noise levels created by the barking dogs. This is certainly hard on both the public and the caged animals. This old shelter lacks any acoustic tiled surfaces to suppress sound. As we move through the courtyard en route to the cat room, we pass by the floor drain in the truck area. “So Jane, Well, the cement….Are cleaned out. Everything goes….drains to the Bay. We finally reached the cat room, a very small and isolated building near the back of the property. This is a favorite spot at the shelter for small visitors because of the cute little kittens. Unfortunately, these kittens don’t remain small for long. The older and bigger animals have much less chance for adoption and a much greater change of being put to death. For so many animals, the shelter is their last stop. The failure of owners to spay or neuter their pets result in many unwanted animals ending up at the shelter. This impacts adoption, reducing the chances of other boarders. The main goal of the shelter is to place its resident animals in good homes. Yet, the fact remains that each year Berkeley destroys more animals than it manages to place into adoption. Over three hundred cat and over three hundred dogs were put to death in 1995. A larger and more modern facility would allow the shelter to hold animals longer, which increases their chances of finding a home. It is obvious from all the problems we’ve encountered that the shelter needs to be replaced, not only for the comfort of the animals and staff, but to facilitate the adoption and neutering to reduce the unnecessary destruction of these animals. There are many ways to remedy this situation. You can urge your elected representatives to act now in appropriating additional funds for the shelter. If you would like to do more, your donations will go directly to help the animals at the shelter. 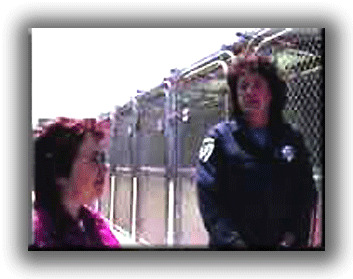 Councilmenber Dona Spring's video "budget hearing " presentation made at the Berkeley City Council May 1996.